The house is in Tovo Faraldi, a characteristic village on the Ligurian hills (345 m above sea level). Deep in the green of the garden, you can admire a breath-taking view on the whole Gulf of Diano Marina. The house is equipped with a solarium and pergola. 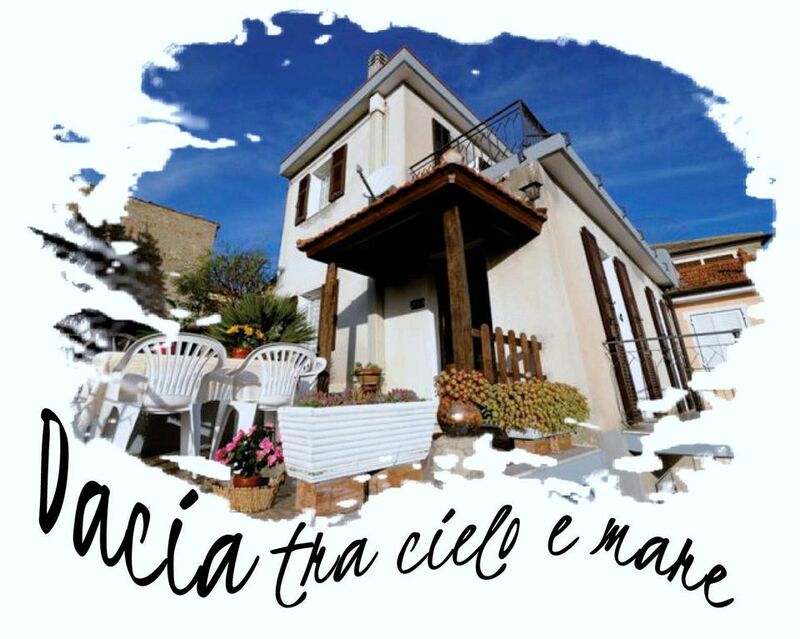 Only 16 minutes by car you can reach the beautiful beaches of our coast, restaurants, pizza places and shops situated in Cervo, San Bartolomeo al Mare and Diano Marina. The house, ancient Ligurian dwelling from the 900, has been recently renovated and now it offers bright and living spaces. The garden is fully enclosed and for the exclusive use of our guests. The garden is full of typical plants of our region in wich is pleasant to rest and get fresh during the summer. The garden has table and chairs for your breakfast, lunch or dinner. It has also a barbecue. There's a play area with a swing and other games for your children. Available to a courtyard where you can park your bikes or bicycles. The house consists of 4 rooms (80 mq) with 6 beds and one cot, a bathroom and a kitchen complete with all the necessary equipment including a washing machine. You can use a speed internet connection and satellite TV. It also provides towels and sheests. The nearest supermarket, is located in San Bartolomeo al Mare. In the courtyard can be parked motorcycles and bicycles. Gepflegtes Haus mit allen Notwendigkeiten, schöner Terrasse und lauschigem Garten zum Verweilen, in toller Lage mit herrlicher Weitsicht und ein sehr freundlicher, zuvorkommender und hilfsbereiter Vermieter! Wir waren zu siebt da. Das Häuschen war gut ausgestattet und servilem auf das Meer und die Olivenhaine war sensationell. Massimo ist ein netter Vermieter der alle fragen sofort beantwortet hat. Der Aufstieg zu dem Haus ist abenteuerlich aber dafür ist man dann komplett im stillen. Nur das Schlafsofa ist nicht für mehr wie eine Person geeignet! Wir hatten eine wunderschöne Urlaubswoche in Massimos Haus. Die Wohnung war tiptop und die Aussicht noch viel besser. Das einzige kleine Manko (welches uns aber vorher bewusst war und dann auch gut zu verkraften ist) ist die kurvenreiche und etwas zeitraubende Fahrt (gut 15 Minuten) zur Hauptstraße. Man sollte sich dessen nur bewusst sein. Die Tage haben wir in vollen Zügen genossen und mit Städtetrips z.B. auch nach Monacco und Nizza sowie Kletter- und Wandertouren in den Seealpen und natürlich baden und schnorcheln im klaren Mittelmeerwasser verbracht. The municipality of Villa Faraldi is located in the upper valley of the river Cervo - also called Steria, the watershed between the provinces of Imperia and Savona, located about 9 km from the beach. The topography is hilly. The main cultural event is the Festival of the village of Villa Faraldi, organized in the month of July. In the various editions have been valued cultural and educational fields such as theater, music, dance and art making the event a great summer event nationally and internationally. The municipality bases its main economic activities related to agriculture, especially olive oil production olive oil. Nel periodo invernale il costo del riscaldamento è già compreso nel prezzo. Deposito cauzionale, Caparra richiesta alla prenotazione. In winter the heating cost is already included in the price. Damage deposit. Deposit requested at booking. Im Winter ist die Heizkosten bereits im Preis inbegriffen. Kaution. Anzahlung bei der Buchung. En hiver, le coût de chauffage est déjà inclus dans le prix. Dépôt de sécurité.